We are delighted to offer the famous Fallen Fruits Laser Cut Cast Iron Half Round Fire Bowl Pit Patio Heater In Woodland Scene. With so many available recently, it is great to have a name you can trust. 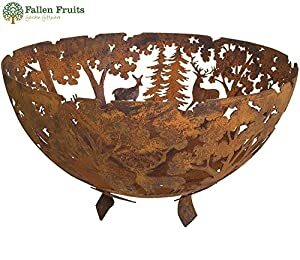 The Fallen Fruits Laser Cut Cast Iron Half Round Fire Bowl Pit Patio Heater In Woodland Scene is certainly that and will be a superb acquisition. 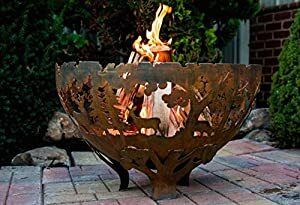 For this great price, the Fallen Fruits Laser Cut Cast Iron Half Round Fire Bowl Pit Patio Heater In Woodland Scene is highly recommended and is always a popular choice amongst many people. Fallen Fruits have added some excellent touches and this equals great value for money. 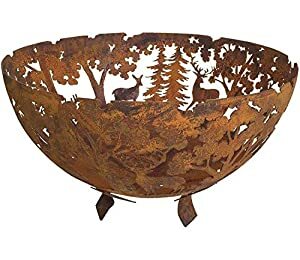 This round fire bowl has laser cut shapes of trees and deer which create a beautiful spectacle due to the flames. Create an inviting ambience in your garden or on your patio with this contemporary Large Fire Pit which should help to keep your guests warm well into the night. The superb low design of the bowl makes it a wonderful feature that will not dominate its surrounding area. Manufactured from durable cast iron this quality product will last you for years to come and is well worth the investment for its durability alone. Easy assembly; comes with 4 screws to attach it to the base. Overall Dimensions: 60cm diameter x H37cm.